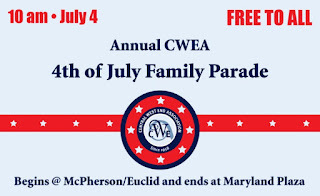 Join us for the yearly parade that starts at the corner of McPherson & Euclid at 10am. The parade ends at the Maryland Plaza fountain and has lots of fun family activities. CWE Families and Friends is a non-profit organization whose vision is to strengthen the connections between families, neighbors, businesses, and community groups in the Central West End neighborhood.